I finally did it. 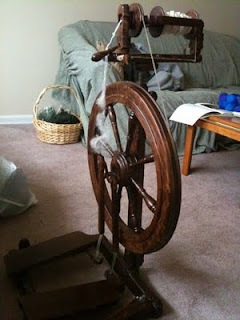 I bought a spinning wheel. About 10 months ago, I visited my Aunt Marie while in Columbus. (She’s the one with the alpacas. I’ve mentioned her, right?) Anyway, while there, she sat me down with a spindle and some alpaca fiber, and right then and there, insisted I learn how to spin. I was hooked. It was so much fun! 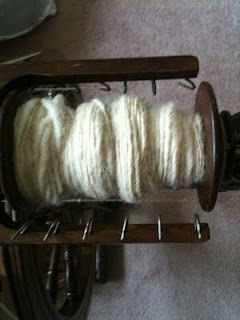 within a few months, I bought a drop spindle of my own, and was spinning like crazy with fiber she gave me. As great as that was though, it’s hard to produce any sort of large quantity on a spindle quickly. so, I started looking into buying a wheel this summer. I had a few that I was considering. I wanted something relatively compact, since I live in a one bedroom apartment. I also wanted something that looked classy though. I know the look doesn’t affect the spinning, but it does affect me. I stalked Craig’s List, Ravelry, anything I could find where people were selling their wheels (apparently, it’s easier for me to validate s pending a ton of money on something second-hand, than paying $100 more for something brand-new. Don’t ask why). about a month ago, someone posted about this Kromski Sonata. She was perfect: compact, walnut finish, beautiful woodwork, plus they were selling her with a woolie winder and extra bobbins. Score! and, here are my second singles. This is a merino top, beautiful blue and purple. It’s so beautiful, I just couldn’t stop spinning it! I have finished filling that bobbin now. 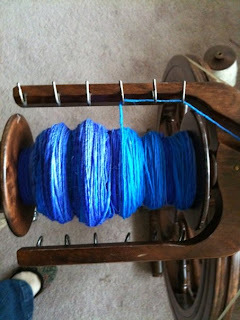 Hopefully next week I will have some plied and set yarn to show off!! Oh, right. I have still been knitting too. Still working on the Blackrose sock. Imagine the first sock, halfway done. Thats how far I am in the second sock. And finally, the Marine Corps Ball is this weekend. So, genius me, at 5pm yesterday, decided I wanted to knit a swallowtail shawl to wear with my gown. 4 days is totally doable, right? Yeah. I can do it. I just need to stay dedicated. And give up sleep. Totally reasonable.